Art With Mr. E: SO OVER THE SNOW DAYS!!!! We have now missed 7 days in a row of school. I'm not a person that enjoys missing school...FOR ANY REASON. One or two snow days....I can deal with it....but....THIS IS GETTING RIDICULOUS! I have an all school art show in little over a month...and being out so many days makes me very nervous about actually finishing the projects. I always start on the projects for the art show as soon as we get back from Christmas break...but a couple of them backfired & I had to come up with new ideas. I'm sure everything will come together...even if we're working on them the week before the show....but I really don't like feeling rushed or behind. 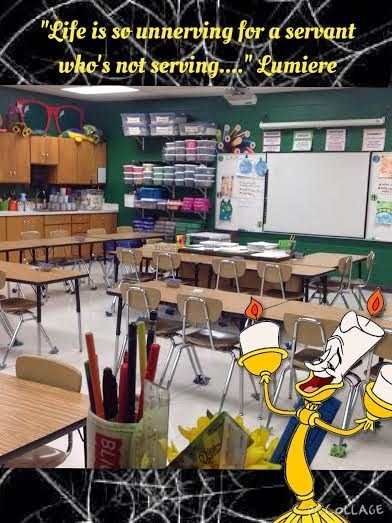 I get what Lumiere said...."Life is so unnerving for a servant who's not serving!" I know what you mean- you've got lots to make/create and missing days is a challenge. My Art Club classes are all working on paper mache, but a couple of the holidays and kids absent with colds, etc., means I don't have everyone at the same place on the project and no way for kids to make up the time. Oh well, we just do the best we can! I haven't seen any of my Monday classes for the entire month of February. This weather is getting insane. I am so sick of the snow! Seven days off from school is just crazy! I live up in Saskatchewan and have only one snow day in my recollection, and that is 13 years of public education and 4 years of university. Even while I was interning at a smaller town school, snow just meant that only the town kids showed up (and farm kids who had parents who work in town). I simply cannot imagine it!